Game #8 Scherzer on the mound again and this time looking to win a series! Bullpen changes coming! If you think that Max Scherzer‘s name as the starting pitcher is a misprint, you are wrong. This is Scherzer’s third start of the season, and with this game he will have started every 2.67 games this season. Scherzer is a starter and not an “opener” so these are legitimate starts. The veteran pitcher has already thrown 205 pitches this season, and has not received a run of support from his offense. Maybe Max needs to take matters into his own hands and knock in some runs, and we all know he is capable of doing that. But then again the Nats scored 4-runs off of Mets starter Zack Wheeler a week ago in just 5 innings. 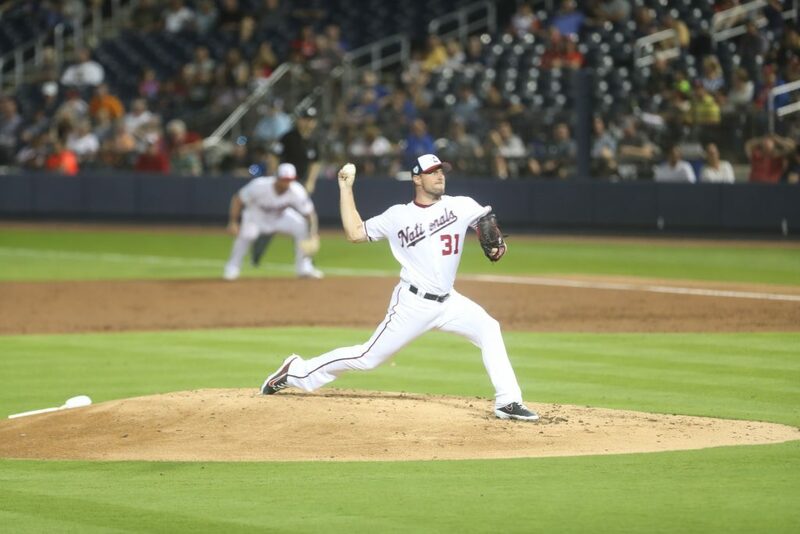 The issue with the Nationals is really not the starting pitching — it is the bullpen. The 8th inning is when you start to pray. In 7-games so far this season, the bullpen has given up 17-runs just in the 8th inning. That is 2.43 runs per game in the 8th inning and a 21.78 ERA in the 8th inning. The Nationals bullpen’s ERA climbed back into double digits at 10.02, and that tells most of the story to say they have been bad as a group is an understatement. With five games in five days this week, manager Dave Martinez cannot push so hard on the 5 arms he has been relying on while at the same time he has gone easy on Trevor Rosenthal who has only faced 7 batters and Wander Suero has faced 10 batters. “Everyday” Matt Grace has pitched in six of the seven games so far and Justin Miller and Kyle Barraclough have each pitched 4 1/3 innings out of the bullpen. Maybe the answer is to get a long-man like Joe Ross and Austen Williams and send back Suero and bench player Adrian Sanchez. Expect one or both today. There is a risk of doing that, but right now manager Dave Martinez needs to cover innings and do it with players he can trust, and at this point given general manager Mike Rizzo’s history it is doubtful that he is ready to “cut bait” with Rosenthal at this point in time. Maybe the former All-Star closer needs more time to gain some confidence and work back into the good graces of his manager. With starts coming up for Adrian Anibal Sanchez and Jeremy Hellickson who are not exactly the definition of “innings eaters” — it would probably be prudent to plan ahead.